Different opinions on orderliness can be a constant source of annoyance and conflict - I know from my own experience. I have come to believe that orderliness depends on how we see and is therefore linked to photography. Why are some people more orderly than others? Why is it that some people are bothered by the tiniest swirl of dust, while others see past even the worst disorder? There is a huge spectrum from cleaning obsession to complete chaos, but even in the middle ground of orderliness, the degree of disorder that demands action varies hugely. Such dissonance among people who consider themselves medium orderly is probably the most disturbing of all. There are several potential explanations why people may differ in their orderliness. Various degrees of laziness, complacency or the lack of time are possibilities. However, I believe that the most important factor is what and how people see. Somebody's vision may be particularly sensitive to color (or even particular tones of color), be strongly stimulated by contrasts of light and dark or respond to geometric patterns. We may also rather perceive an overall image, the impression of a scene, or be particularly attentive to details, the individual elements of a scene. Such differences are certainly founded both, in nature and nurture - they can be due to biology (e.g. the way our eyes function) or "history" (e.g. experiences and culture). I believe that our visual preferences are mainly shaped by what our sense of sight is most sensible to and that this also determines seemingly unrelated characters such as orderliness. Therefore, photographs reveal more about the photographer than you may think! Facades are a treasure trove of regular patterns and for the discovery of geometric compositions. 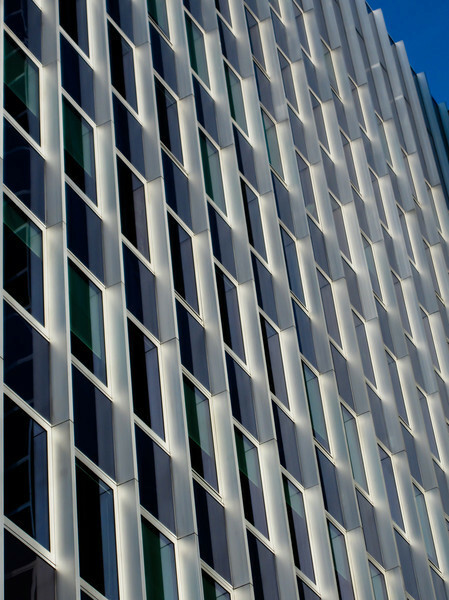 Here, the facade of an office building in Zurich, Switzerland, provided the orderly pattern.